" . . . the strong storytelling makes this a fine album from a trio with a future." Nashville, TN (April 27, 2018) - - Southern Halo's much-anticipated, dream-inspired concept album, JUST LIKE IN THE MOVIES, premiered globally earlier this week on Taste of Country and is available now from iTunes. The group's current single, the feel-good sing-along "Anything Is Possible," is moving up the Billboard Indicator and MusicRow charts. The popular trio has promoted JUST LIKE IN THE MOVIES extensively, traversing 19 states, traveling over 12,000 miles and visiting 42 radio stations since February. The Mississippi natives performed for three weeks on the High School Nation Spring Tour, and live at the stations they visited, including KIX 101.1 Radio, KBOE Radio and KTTS Radio. The group also stopped by WDVM-TV in Hagerstown, MD for some screen time before headlining iHeartRadio affiliate WFRE's Random Act of Country series. The new disc features 10 songs written or co-written by the trio's lead vocalist Natalia and four titles from Music City's hottest tunesmiths. 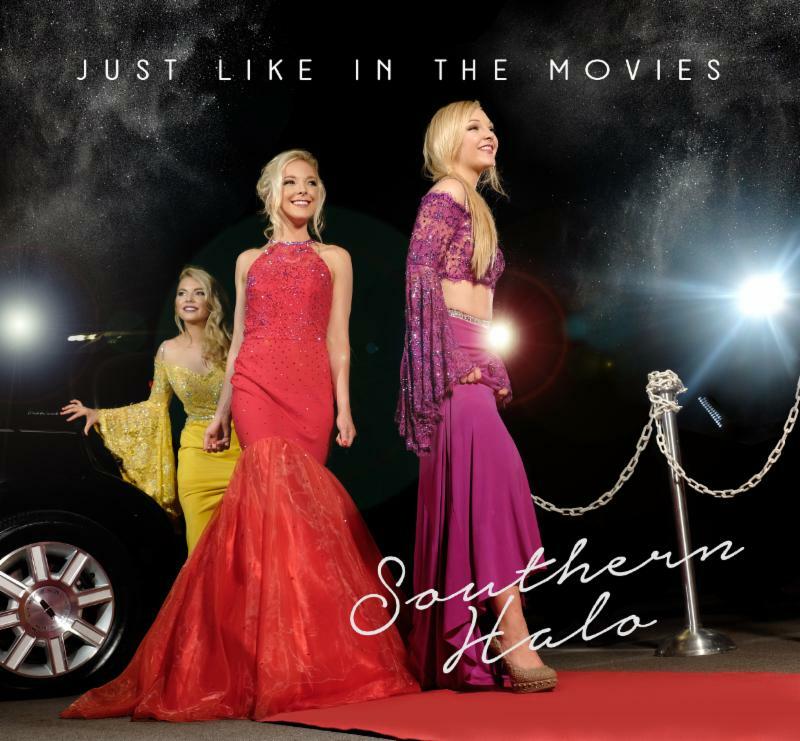 Produced by SESAC's 2012 Writer of the Year Catt Gravitt (Kelly Clarkson, Jake Owen) and Gerald O'Brien (Martina McBride, Trace Adkins), the album mirrors the emotional and musical growth of Natalia, Hannah and Christina Morris, the three sisters who form SOUTHERN HALO. The collection is proving popular with industry tastemakers as well, with recent features and interviews:Wide Open Country, Digital Journal, Center Stage Magazine, Celebrity Secrets Country, Hallels, Battered and Brewed, Music Matters Magazine, Whiskey & Cigarettes Show, KIX 96 Country and WQNZ Radio. Reviews can be found: CMChatlive.com, BringCountry2UK, Country Music & Dance Scotland, 360Magazine, Midwest Record Recap, Stacy's Music Row Report, and Nashville Music Guide. More coverage is coming soon from Pop Culture, Maverick Magazine, Cross Country Magazine, Acoustic Guitar, Country Music People, Crank It Country and ParcBench. Concert Series. When they are not touring, the Morris sisters now call Nashville home.